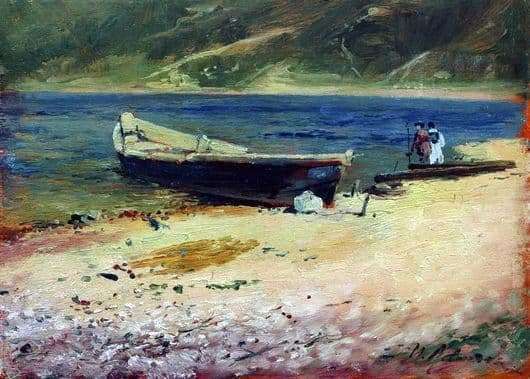 The painting “Boat on the coast” was painted by I. Levitan in the 80s of the XIX century. This extraordinarily beautiful canvas, painted in oil, is kept in the regional museum of the city of Omsk, named after Mikhail Vrubel. Despite the seeming simplicity of the landscape, the picture is beautifully painted, the skill of Levitan is shown here at the highest level. In the painting “Boat on the Shore”, the viewer sees an uncomplicated seascape: the coast, the water, the mountainous area behind. But this simplicity fascinates looking at the canvas, because Levitan always excited and conquered the beauty of the world, he wanted to portray her as lively as possible. In the foreground of the canvas stretches a sandy seacoast of light shade. On the shore there is a wooden boat chained to a peg. Behind her are men stretching away. Perhaps it is the fishermen who arrived to the house on this small boat. The middle of the canvas is water. It comes in contrast with the light shade of sand. The water on the canvas is depicted saturated blue, but calm. The day should be running out, the workers are returning home, and the sea does not shine under the rays of the sun. In the background are pictures of the green hillsides, light threads of roads leading to human habitation. The picture conveys to the viewer a sense of calm, tranquility, idyll. Fishermen returning home, waiting for a hot dinner. The coast is calm, with only slight slight ripples on the water. The viewer also wants to be here and walk along the sand, breathing the sea air. In the landscape “Boat on the coast” warm, light colors and shades prevail. Only the side of the boat, which is in the shade, is colored dark brown, close to black. In general, the picture looks optimistic, which was not always possible for the famous landscape painter.